Please refer to our stock # 10367 when inquiring. Caroline van Hook Bean was born into a well-to-do family in Washington, DC. Her father, Tarleton H. Bean was a noted ichthyologist at the Smithsonian Museum. At the age of 14 she was sent to Paris for a year to study drawing. She graduated from Smith College in 1903 and studied at the NY Academy of Design with William Merritt Chase. She travelled frequently to Europe and studied with John Singer Sargent in London, Harry Thompson in Paris and Bernard Blommers in Holland . In 1913 she married Blommer' son, Bart. Their marriage ended in 1918. Between travels to Europe, Bean lived in New York until 1921 when she moved to Washington, DC. In 1927, she married English automotive engineer Capt. Algernon Binyon. They traveled extensively through the US, Bean painting portraits all along the way. Their marriage lasted until Binyon's death in 1941. 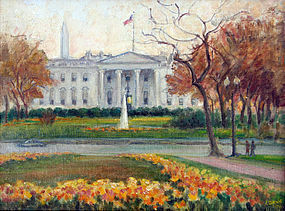 Bean remained a resident of Washington, DC until her death at 101. She was actively painting well into her 80's. Bean is best known for her portraits, florals and city street scenes of New York and Washington. She was an active member of the Society of Washington Artists, the Arts Club of Washington and the Society of Washington Etchers. She exhibited at numerous museums and galleries including the Corcoran Gallery of Art, the Art Institute of Chicago and leading New York and Washington commercial galleries. Peter Falk. "Who Was Who in American Art, 1564-1975"
Mantle Fielding. "Dictionary of American Painters, Sculptors & Engravers"
Virgil McMahan. "The Artists of Washington, DC 1796-1996"
Chris Petteys. "Dictionary of Women Artists"